I had a similar problem to the eMac issue you describe in the column The Future of eMacs in the Age of Leopard. I found that if you disable SSD and then install the ATI Displays program (not the updated drivers; this was like the ATI Displays control panel in Mac OS 9.x), you can "force" single-display mode and have all resolutions available without the goofball virtual desktop off to the side. Thanks for writing. This eMac has been frustrating me for months on and off - mostly off, because the problems (locking up, USB ports die after a while, sometimes booting into what looks like 4-bit grayscale) have made troubleshooting difficult. I've zapped the PRAM, cleared the NVRAM, and even wiped an external FireWire drive, put clean versions of Panther and Tiger on separate partitions, and still have problems. Anyhow, I've just installed RDU 4.5.7, rebooted the computer, and now I have access to all the resolutions the eMac is capable of supporting. Thanks a million! The comments I've seen lately about the G4 iMac has caused me to want to throw my 2 cents worth in. Personally, I fell in love with the G4 iMac after seeing it for the first time at Micro Center. I thought the design was pure genius, as it looked like no other computer ever made. It just goes to show what can be designed in the day of flat panel LCD displays. I was determined to own one, but I lacked finances in those days. 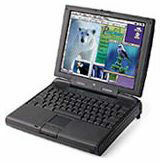 Instead I bought a used 800 MHz G3 14" iBook, as I needed a laptop more than a desktop at the time. However, when I heard in 2004 that there was a new iMac on the horizon that was a completely new design, I felt I had to act fast if I wanted a new G4 iMac. Without even knowing what the new G5 iMac would look like, I made the plunge and bought the very last 17" 1.25 GHz G4 iMac that Micro Center had. Nope, I do not regret buying it, as I still love the design. Call it an "iLamp", "Luxo Jr.", "Half-a-VolleyBall", or whatever you want, I don't care. It definitely is the oddest designed computer ever made! I guess that's why I love it. Even though I've since upgraded to a Dual Core 2 GHz G5 Power Mac, I'm not selling my G4 iMac! I won't deny that the iMac G4 design was sheer genius. The seemingly floating monitor that pivots and adjusts to your needs is brilliant. I'm simply not enamored of the overall look of the G4 iMac, although I know a lot of people love the design. Someone gave it to me, I don't have them. and I found stuff off your site. I downloaded the manual and found that command-C is supposed to make the CD drive read during start up. But no dice for me. All I did last night was download the iCab browser and then shut it down. It was working great! What is SOM? How do I install it? Where can I get startup disks to get me going again? Will you share some copies of your startup/boot disks? It's a PowerBook 3400c, OS 8.6. I want it to be my Internet radio receiver. This Mac important to me in that it's my Alps decal printer mule. I appreciate any help or advice. You only have to hold down the C key during startup to boot from CD, not command-C. I have no idea what SOM is, sorry. You might try asking on our PowerBooks list, which covers all pre-G3 PowerBooks. I just checked my box of CDs and discovered I don't even own a copy of Mac OS 8.6 (although I do have 8.5, which can be updated to 8.6 for free with an updater from Apple). You might try our Swap List and some of the stores that advertise on LEM if you need a copy. Finding out more about it. System Object Model (SOM). It's gone by the wayside, but back then it was the thing. Learning how to create boot disks is complex. I'm using a PowerBook G4. I stumbled across your page, IBM Model M: The Best Computer Keyboard Ever, on model M keyboards while Googling for info on how to use a Model M with my G4s. You mentioned that you've used your model M with some of your Macs for some time now, and I'm curious as to how you accomplish this, as every G4 I've tried to use mine with fails. I know that my PS/2 to USB adapter is good, because it will work fine as a USB device in Linux and XP. (And, oddly enough, the keyboard and adapter worked fine on an old Bondi iMac I tried it on under OS 9.) I'm thinking that maybe the onboard ports on my G4 aren't supplying enough power, but I'd appreciate your thoughts on it. I've never used an IBM Model M keyboard with a Mac. I've forwarded your email to Andrew Fishkin, the author of that column. Also see IBM Model M and Apple Extended II Among Best Computer Keyboards Ever by Tommy Thomas, which mentions a USB adapter guaranteed to work with Macs and the Model M keyboard. There was a recent post on the mailbag about TrueType fonts rendering slowly and causing system slowdown on System 6/7 systems. However, there is one minor detail missing there. On screen, many fonts would render quickly if their bitmapped counterpart was installed. For example, if one installed the 12-point Chicago bitmap along with the TrueType version (both versions were included in the suitcases that came with the system software) it would appear as quickly as any bitmapped font would despite the fact that its TrueType counterpart was installed. Where slowdown occurred was in the case of sizes not installed. Using Chicago as an example again, there was never an Apple-produced Chicago 24 point (though Dubl-Click Software did release it as part of World Class Fonts). In Broderbund's Print Shop, for example, there was extensive use of larger-size Chicago than 12 point (the only size Apple supplied). The words in this larger Chicago look good on the screen when TrueType is used, yet it does indeed take slightly longer for the program to load as a result of this. This is why during the 680x0 days the fonts all came with both bitmapped and outline versions - the slower Macs needed the speed advantage (and with System 7, it needed all the speed boost it could get). I remember the early days of TrueType, back when I was working at ComputerLand of Grand Rapids (the first Apple dealer in Michigan! ), and some of the guys would remove bitmap fonts for TrueType fonts to keep the System smaller - not taking into account the processing overhead of that decision. Why exactly would Apple want to deinterlace DVDs? You lose quality whenever you deinterlace, or interlace for that matter. You should leave the video alone and just play it the way it was designed. How many DVDs are interlaced anyway? As far as I know only the full frame or full screen DVDs are interlaced. I haven't encountered a widescreen DVD that was interlaced. The same can be said for 3:2 pulldown. Why would Apple want to do that? Either the DVD is 24 fps or it's 29.97 fps. Either way it should be played in its current format instead of converted to something else, with a resulting loss of picture quality... I must be missing something here? I would be interested to hear your video dude readers comment on this. I like the new logo by the way. You've got me on that one. I suspect it has to do with other video formats that DVD Player plays. Your readers are right; the Allegro USB 2.0 PCI card doesn't support deep sleep in Power Mac G4 or G5 computers. Any idea why you've not had an issue with it? I was surprised when I installed mine to discover that I can go into sleep, but not get out of sleep with the darn thing installed. From Sonnet's website <http://eshop.macsales.com/item/Sonnet%20Technology/USB2/>: (2) Allegro USB 2.0 does not support deep sleep in Power Mac G4 and G5 computers. Deep sleep removes power to PCI cards and is not supported by PCI cards that can connect to external devices. I just checked my Energy Saver settings. My Power Mac G4, which not only serves as my production machine but also shares my iTunes and acts as an FTP source for some files linked on Low End Mac, is set to never go to sleep or power down the hard drives. That's why I've never had deep sleep problems. Go to the Low End Mac Mailbag index.